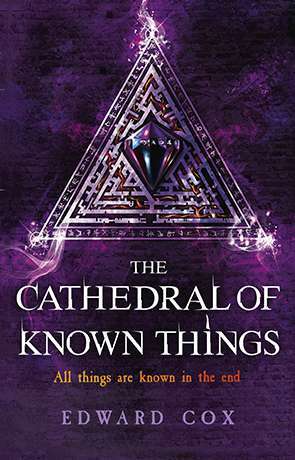 The Cathedral of Known Things is the sequel to the fantasy novel The Relic Guild by Edward Cox. The ongoing story of the agents of The Relic Guild as they seek to oppose their enemies, the Genii. The Guild is trying to prevent them from achieving what they started in the previous war, the destruction of humanity and life as they know it. As in The Relic Guild, the story is split between two timelines forty years apart. The apparent present where the Genii have come out of hiding and taken over Labrys town and the Guild follow a trail laid for them by an unknown benefactor in the hope that this will lead them to a permanent solution. The earlier timeline where the agents of the Guild are embroiled in the war which gives us the readers the insight into how or why they ended up in this position. The use of the timelines is interesting, the earlier story on its own, if it were told in chronological order, would perhaps feel like it had little point and the later story would, perhaps, lack depth. However told together the earlier story provides the depth, the character motivation, the history and the later story provide the plot and the drive. The switch between the timelines is at chapter breaks and is not generally too confusing. The nature of the magic in the books helps to provide insight to the characters that have these qualities. Most of the human population does not have magic; it is the Relic Guild that is an exception to this. Magic types, such as empathy, illusion and precogniscience, would be seen as passive in other fantasy world, here take on a more active role. The Empath can not only feel what someone is feeling, but can use this to manipulate them, even to the point of taking their own life. How does an Empath, who cannot forget the emotions of others they have shared, feel at the point of the other’s suicide, that they know they have caused? How does a young girl feel when she is forced to allow her body to go through painful changes into a creature that she can’t control, when all of her “mentors” are telling her to accept the changes, while they themselves are clearly scared of the outcome? The issues of identity, who are we when we cannot control our own bodies never mind our lives, are explored through the characters experiences. While the reader cannot relate to the experience of being a changeling or an empath, the feeling of a life outside our control is something we are all familiar with. While none of the main character display the outward trappings of religion, the issue of faith becomes central to the plot. The Guild agents are put in a position where they must trust that the Avatar leading them is sent from a benevolent philanthropist rather than someone who would lead them astray. Even more fundamentally, they must believe that the cause they fight for is worth dying and sacrificing everything for, despite the fact that the Timewatcher, in whose name they fight, has abandoned that cause and they who fight for it. The plot has echoes of the Old Testament, Lucifer’s fall from grace and the Spiral’s betrayal of the Timewatcher both stem from jealousy of the deity’s love for humanity. The absence of that deity following the fall perhaps reminiscent of (among others) Philip Pullman’s take on the “Authority” of the His Dark Materials series. This book can’t really be read out of context from The Relic Guild as it is a directly continuing story and ultimately if you liked that one, then you don’t need me to sell you the second one, if you haven’t read that one, then clearly that is the place to start. Written on 7th December 2015 by Karen Fishwick.